David H. Caldwell, Mark A. Hall, and Caroline M. Wilkinson have written an interdisciplinary paper on the Lewis chessmen, uncovered in Scotland in 1831. They are centuries-old, walrus ivory chess pieces, 78 in all. The authors suggest the story may have become too streamlined to reveal reality. Whether kings or princes from the Isle of Man or descended from Somerled, local nobles or high-ranking clerics, there were several men in late Norse Lewis who could have aspired to own the Lewis pieces, and who would have valued them as gaming pieces. Rather than accepting the deus ex machina explanation of a passing merchant losing his stock, it is surely more plausible that the Lewis pieces were found in Lewis because that was where they were intended to end up and be enjoyed. There are two final points to make here. First, no matter how or why the Lewis pieces arrived at Uig, it is only a presumption that they were new when buried. If they belonged to a local nobleman or cleric they may have provided many years of enjoyment before they passed out of use. This is a significant point to which we will return after a more detailed analysis of the individual pieces. Second, the circumstances of the hoard’s discovery are so vague that there can be no confidence as to whether it was lost or deliberately hidden. The storm had passed by the Monday, but it was still overcast, dull light suffused with a grey-green, as if we were all somehow trapped inside a Tupperware box. 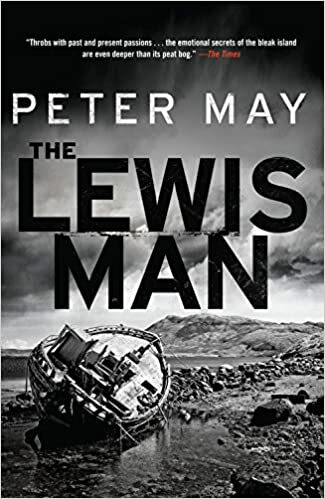 I’ve reviewed the first two books of Peter May’s Lewis Trilogy below. 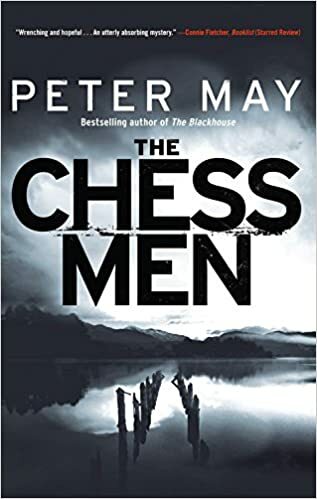 The Chessmen is the third (the title refers to the famous “Lewis chessmen,” a remarkable set of Norwegian chess pieces discovered on the Scottish island of Lewis, the site of these books, centuries ago. They represent a 12th Century king and his court and warriors). This time around Fin Macleod, our hero, is still living on Lewis, where he grew up, having left the Edinburgh police force. He takes a job as a security officer on a large estate, to solve the problem of poachers taking wild salmon. This leads him to a hike in the mountains with “Whistler,” an old friend. They discover a rare phenomenon – one of the mountain lochs has spontaneously drained, and they observe a small private airplane lying on the newly uncovered bottom. They both know immediately who must be inside – their old friend Roddy, who was involved with them in a rock and roll group in their college years and disappeared in this very plane. As with the other books in the series, the story takes us into the past, to old relationships and old secrets. An interesting subplot involves Fin’s old friend/enemy Donald, now the pastor of the local Free Church, who has to defend himself in a church hearing, accused of the trespass of killing a man to save lives. The ending is a shocker. Very good, especially the high quality of the prose. Cautions for language, and hard (but not entirely dismissive) statements on religion. Recommended. Beyond the curve of the hill, Fin could see the dark roof of Crobost Church dominating both the skyline and the people over whose lives its shadow fell. Someone had hung out washing at the manse, and white sheets flapped furiously in the wind like demented semaphore flags urging praise and fear of God in equal measures. Fin loathed the church and all it stood for. But there was comfort in its familiarity. This, after all, was home. And he felt his spirits lifted. I gave the first volume of Peter May’s Lewis trilogy, The Blackhouse, a mixed review the other day (see below). I thought the writing superior, but the main character inadequate. Fin Macleod, the hero, seemed to me a little passive and emo (too much like me, frankly) to be a mystery detective. But the setting in the Outer Hebrides was fascinating and seductive, and I bought the second book, The Lewis Man. I’m glad I did. I consider this one considerably better, and the first wasn’t all that bad. Fin Macleod is back in his childhood home at the northern tip of the island of Lewis. His career as an Edinburgh detective is over, as is his marriage. He’s at loose ends, still mourning the death of his young son, but now he has living connections on Lewis, including Marsaili, the woman he was in love with as a boy. Though he lacks an official police position, Fin is asked by his friend George Gunn, local cop, to come and assist when a body is found buried in a peat bog. At first they think it’s one of those famous prehistoric bog burials, sacrificial victims perfectly preserved in the acidic peat, that show up in northern Europe from time to time. But this victim has an Elvis Presley tattoo on one arm, which makes the death a modern murder. The investigation uncovers a tangle of old secrets involving the treatment of orphans and organized crime. And it soon becomes clear that Marsaili’s father, now sinking into dementia, is not the person he claims to be. DNA evidence shows him to be a close relative of the murder victim. Is the gentle old man a killer? I liked Fin Macleod much better this time around – he acted more like a detective, even off the payroll. And the writing was once again exceptional – especially the descriptions of Hebrides scenery and weather. The ending was perhaps a tad contrived, but it was also satisfying and emotionally touching. Recommended. Cautions, mostly, for language.